The city of Basra is facing a new chapter in the series of "tragedies" that have taken place this year. After the record rise in temperature, low water levels and deterioration of public services, the city faces a "humanitarian disaster". The population has been overcrowded in hospitals over the last few days. The Basra Human Rights Commission described the situation in the province as "serious" due to high salinity and increased pollution, noting that the government did not record any action equivalent to the magnitude of the disaster. "In view of the serious and delicate conditions in the province of Basra these days of high saline tongue, and increased pollution, which led to injuries to thousands of citizens, no government action was recorded equivalent to the magnitude of the disaster." The Commission called on the central government represented by Iraqi Prime Minister Haider al-Abadi to "move with the ministers of health, environment and water resources to Basra to stand on this disaster and reassurance to its people who are preparing the greatest wealth and those who are ravaged by pollution and lack of medicines," the prime minister called for " By all human standards. " 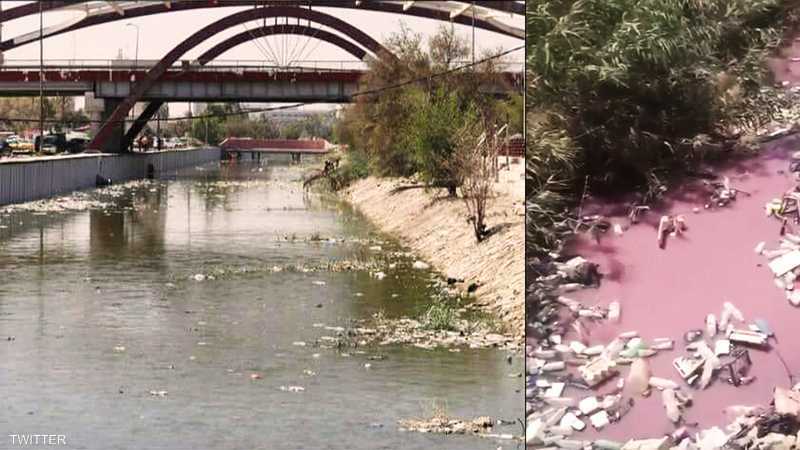 The pioneers of social networking sites published "shocking" videos of the rivers in the areas of and around Basra, including the city of Abu al-Khasib, where the river turns red because of the saturation of contaminated materials. The label "Basra is crying out" and "Basra is dying" on Twitter, amid the great anger of the population of the city and the people of Iraq in general on the deterioration of the situation. Images of river water in Basra and daily use water, which are clearly contaminated, have emerged as a brownish phenomenon. Photos and videos posted on social networking sites also show overcrowded hospitals with poisoned citizens, while hospitals suffer from a lack of services. 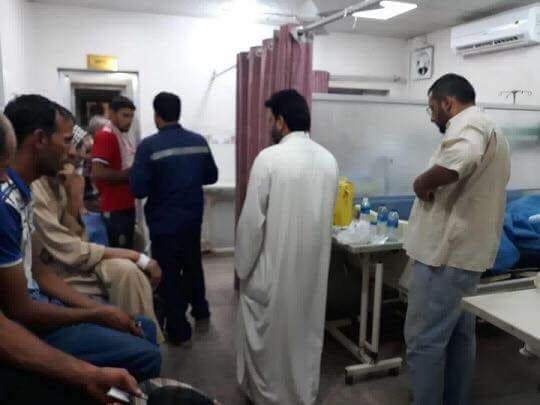 According to the data on social networking sites, activists sent a distress call to all countries of the world, and to all embassies and consulates in Iraq, because of the overcrowded hospitals in Basra due to poisoning by salt water, and the death of cattle and fish in the province. Basra is one of the wealthiest provinces in Iraq with natural resources such as oil and gas, and is considered the only port of Iraq. The Health Control Division of the Basra Health Department revealed the high rate of pollution in the province's sewage water very much. "The chemical pollution in the water is 100% and the bacterial contamination is 50%." As well as environmental pollution due to smoke and gas emissions from oil wells. For her part, confirmed the former deputy of the province of Basra, Fatima Zarkani, "pollution of the province's water and people refrain from drinking," calling on the government to "expeditiously save the population from this disaster." 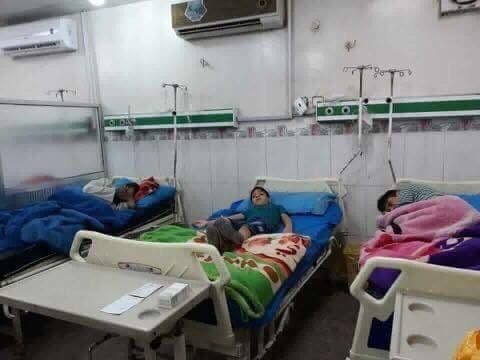 In a press statement, a member of the provincial council of Basra, Karim Shawak, earlier this week, more than 4,000 people were infected with diarrhea due to contaminated water. While the Department of Health of Basra poisoned as a result of drinking polluted water transported by the pelvic vehicles provided by the government to solve the problem of water in the province. According to the Health Department, the percentage of chlorine in most desalination plants is zero percent. An official at the Iraqi Ministry of Agriculture has confirmed earlier this month that the cultivated areas in the country fell by half, compared to last year, following the drought and the low levels of the Tigris and Euphrates. Iraq, dubbed "Mesopotamia" by the Tigris and Euphrates, suffers from water scarcity, which has suffered a significant drop in the number of years. Apart from the lack of rainfall, the main cause of the drought remains the diversion and cutting of rivers flowing into the Tigris and the Euphrates by Turkey and Iran, experts say. Turkey has recently started operating the Alesso dam on the Tigris River, which is a blow to agriculture in Iraq, whose repercussions will appear in various aspects of life.